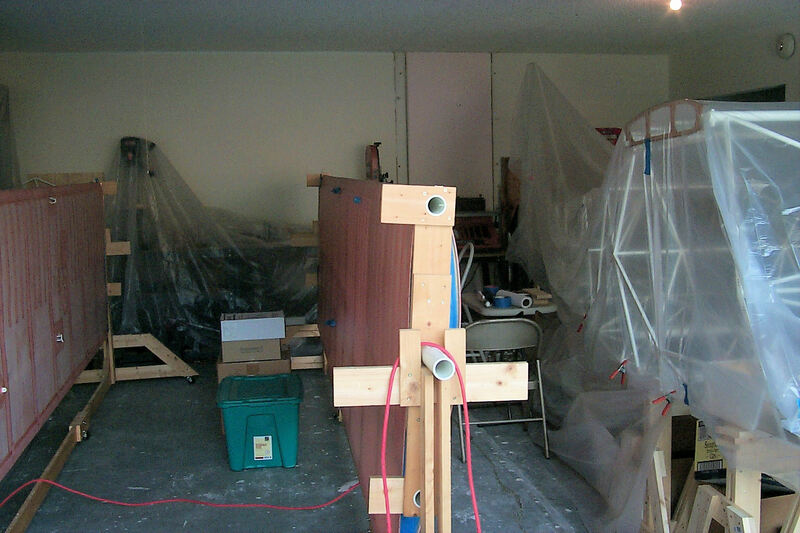 9 December 2011: Preparing to paint. The weather is dry and cool enough for painting. 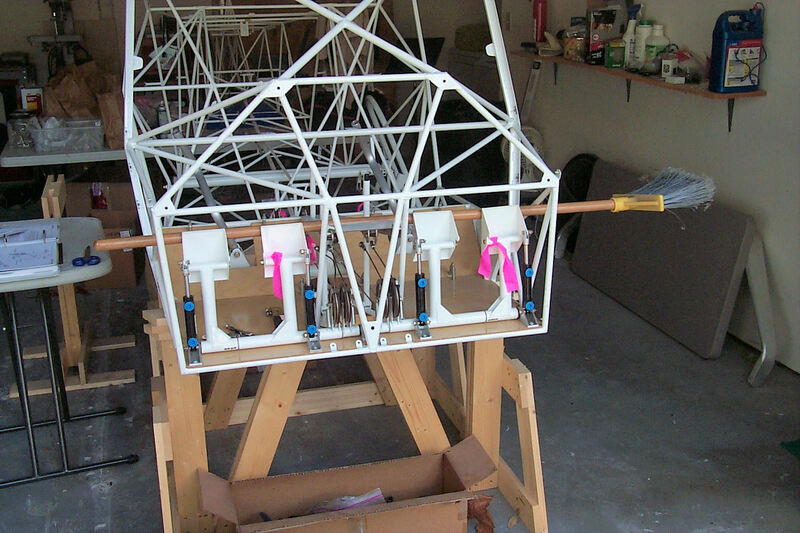 I intend to paint the wings to the final coat of poly-spray. 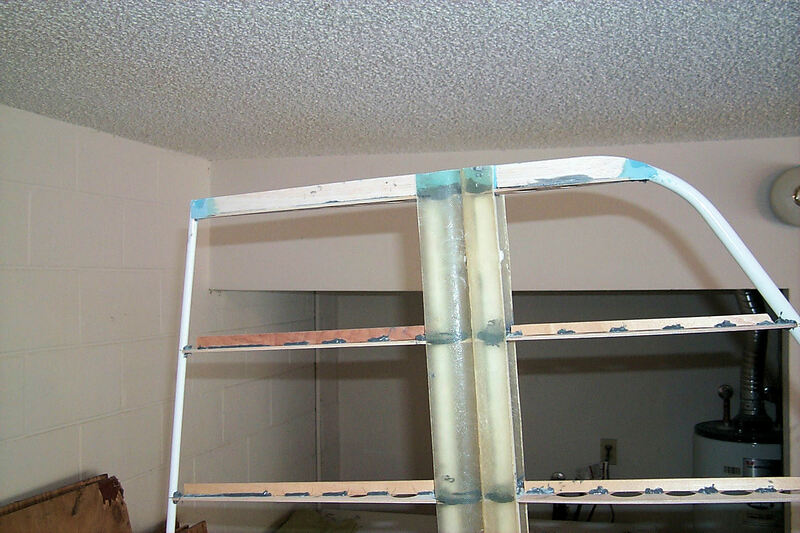 Before the first color coat. 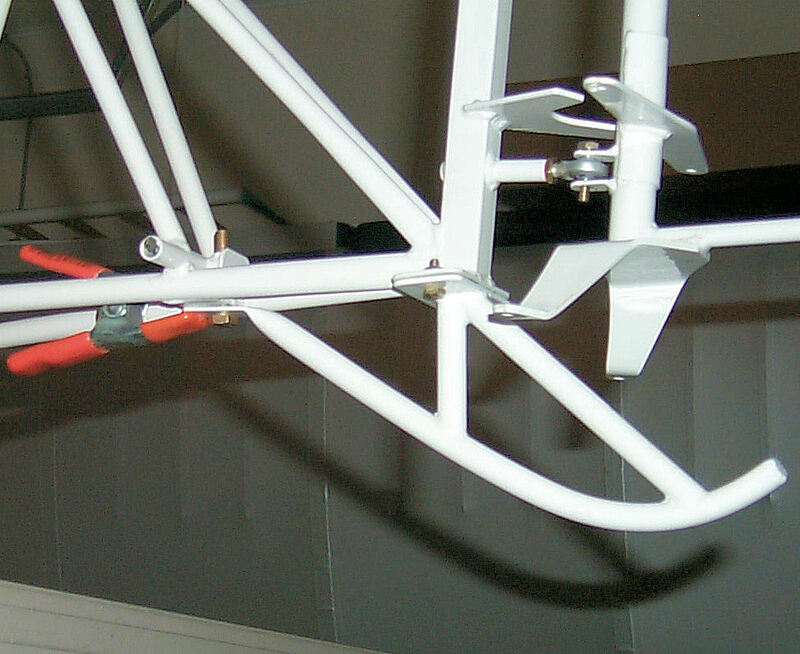 My experience painting in the hangar showed me that my HVLP equipment produces very low overspray. With that in mind I'm using drop cloths instead of a paint booth. In the photos you can see that I have a lot more to cover up. 15 December 2011: Far from Ideal. The lack of ventilation forces me to paint with the door open which means I have to pick the weather. 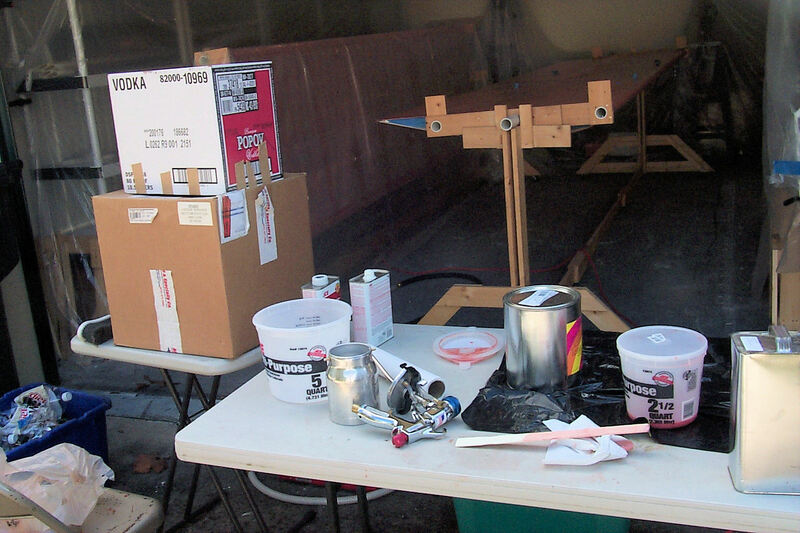 It was good today and I was able to spray the last coat of Poly-Brush on the right wing. 16-17 December 2011: Finished with the Poly-Brush. 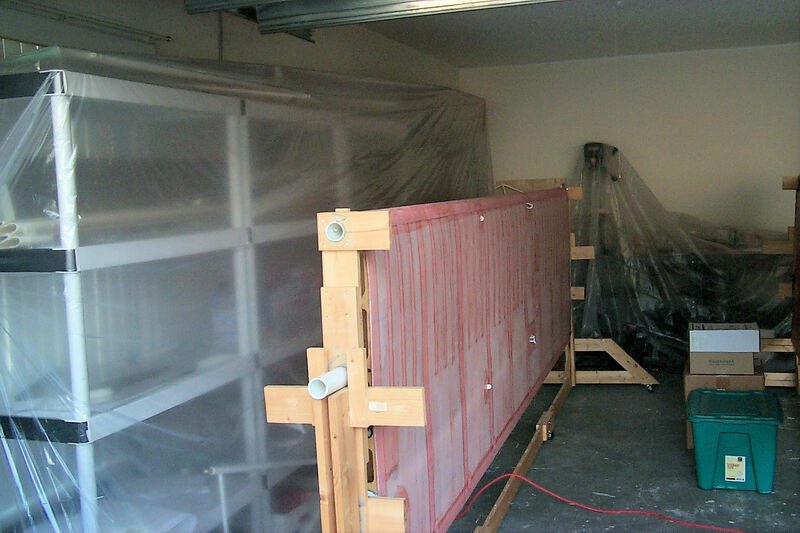 21 December 2011: First coat of Poly-Spray. This is on the left wing. All the bumps and bubbles stand out. I now have a full understanding of why you wet-sand the second coat. 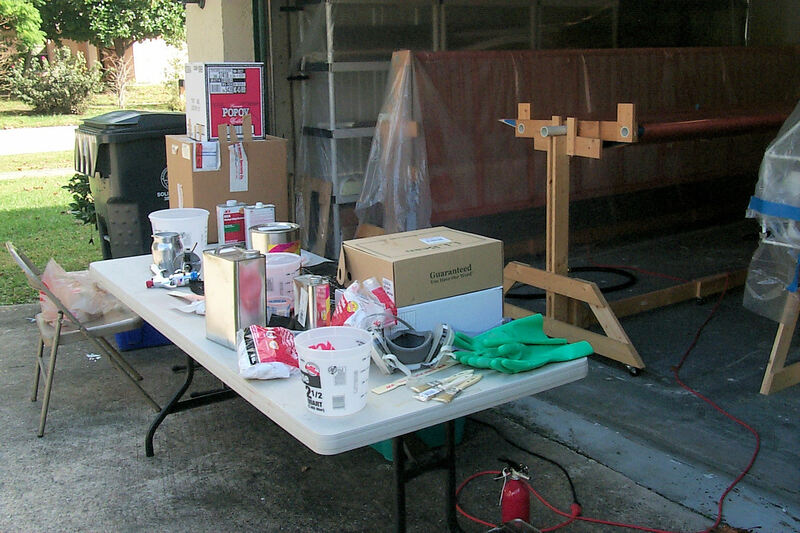 22 December 2011: Second coat of Poly-Spray. 23 - 28 December 2011: The Holidays slow me down. 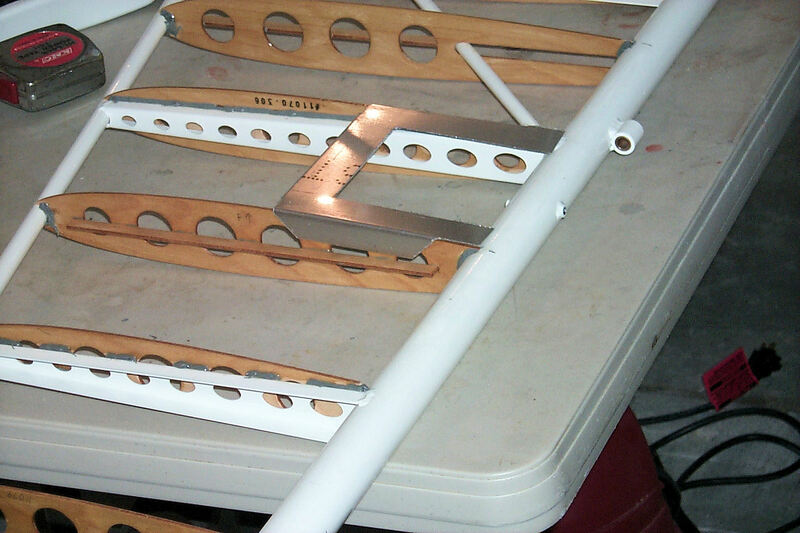 I managed to wet-sand the left wing (very lightly) and clean it for the third coat. 31 December 2011: New Years Eve! 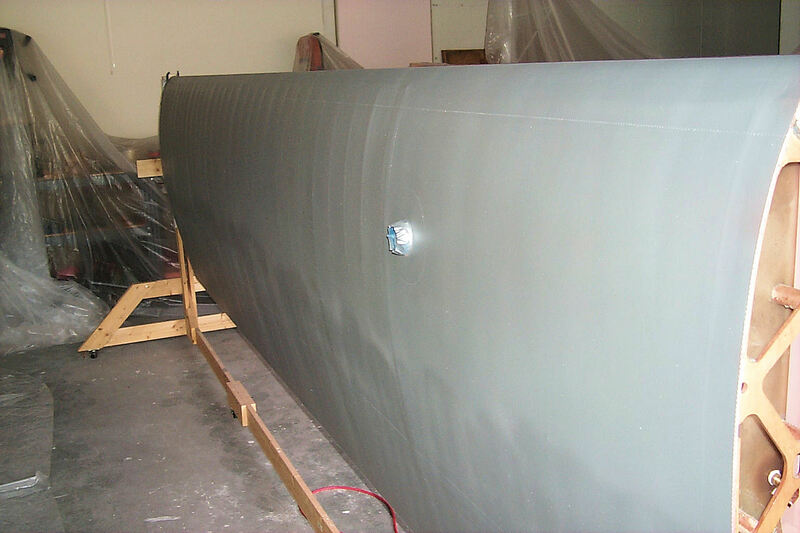 The left wing now has three coats of Poly-Spray. Notice the "path" down the center. 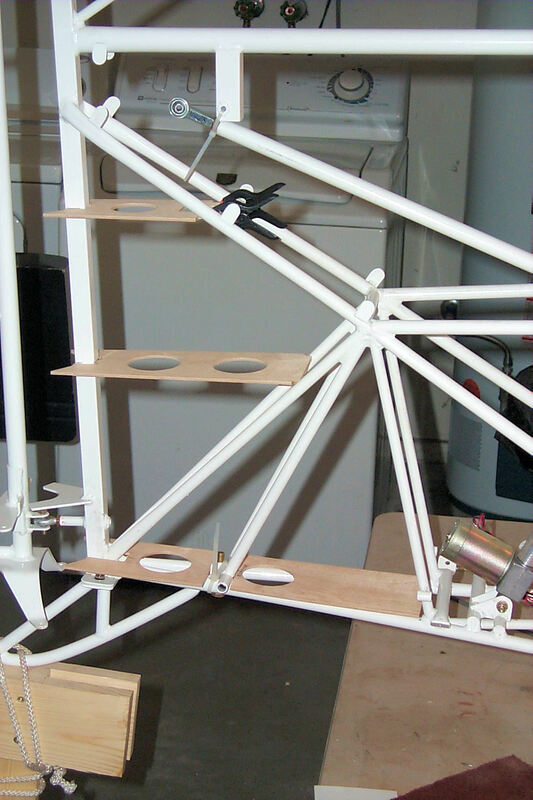 This is because I rotate the wing to the horizontal and spray from one edge then the other. 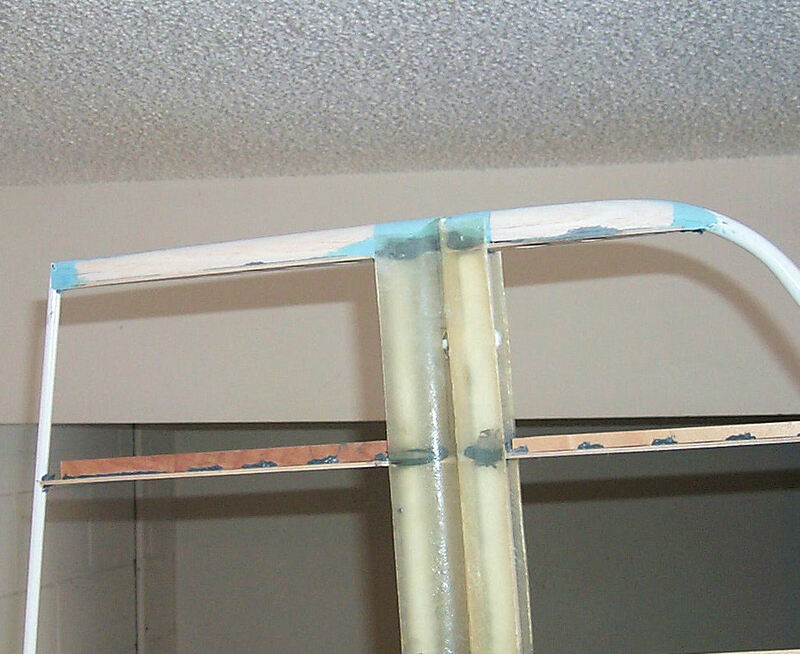 To avoid this when I spray the color coats I'll have to incline the wing so that I can spray the wing from one edge only. 1 - 8 January 2012: Cold weather comes to Florida. For a few days the cold and wind curtailed my painting. 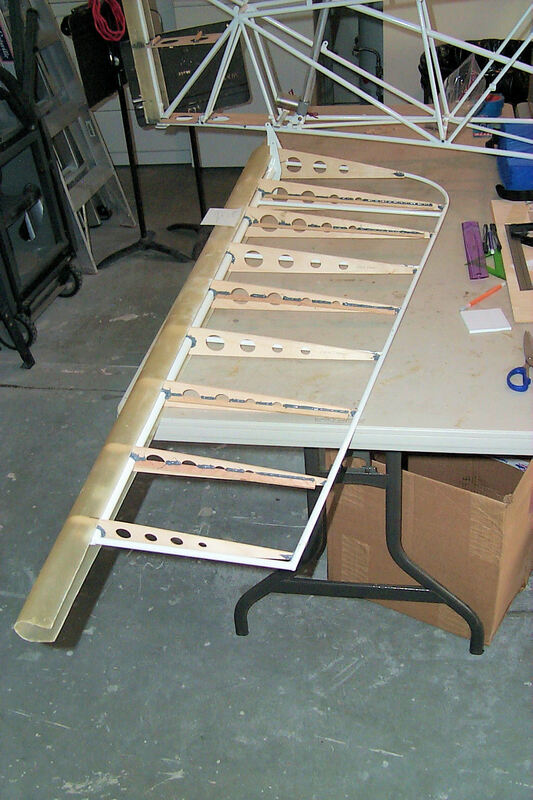 But, at last, I have two coats of Poly-Spray on the right wing, it's wet-sanded, and ready for the third coat. I'm ready to be done with painting and get back to building. 9 January 2012: Painting is finished for now!! 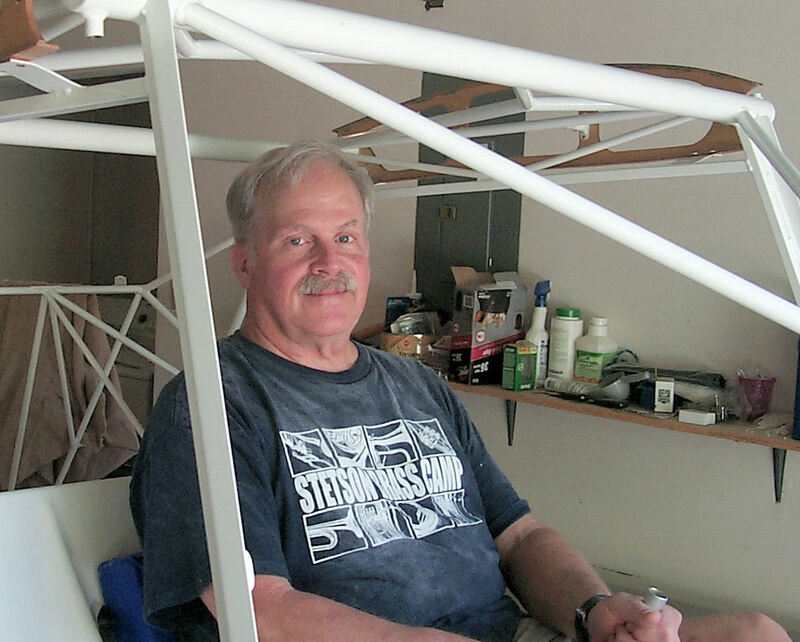 12 January 2012: I'm back to work on the fuselage. 16 January 2012: I really don't like rivnuts. But sometime they're the only thing that will solve a problem. The mounting tabs for the boot cowl were pre-drilled for camlocks but, I didn't want camlocks for this application. The holes didn't align with nut plates so I used rivnuts. 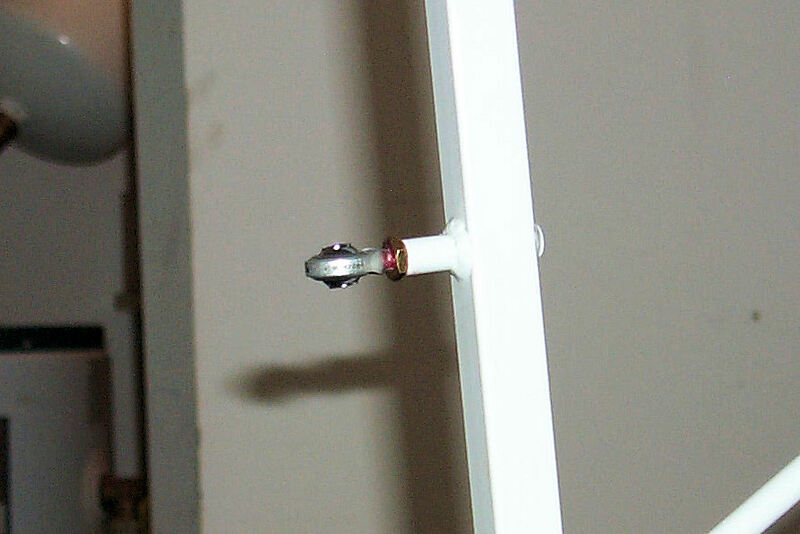 Rivnuts can loosen and spin in their mounting. In an attempt to prevent this I used epoxy to help secure them in place. 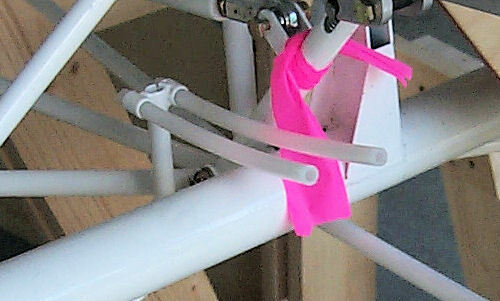 18 January 2012: The threaded bushings were obstructed with powder coating. A little effort with 1/4"-28 tap fixed the problem. 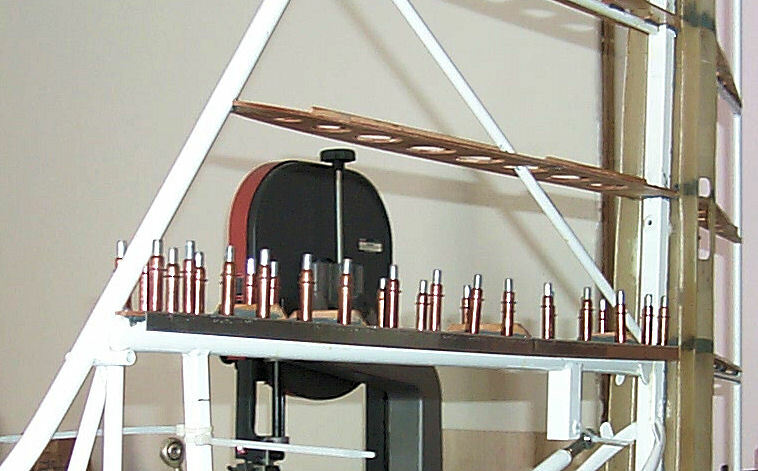 A little tinkering with the rod ends to align them. 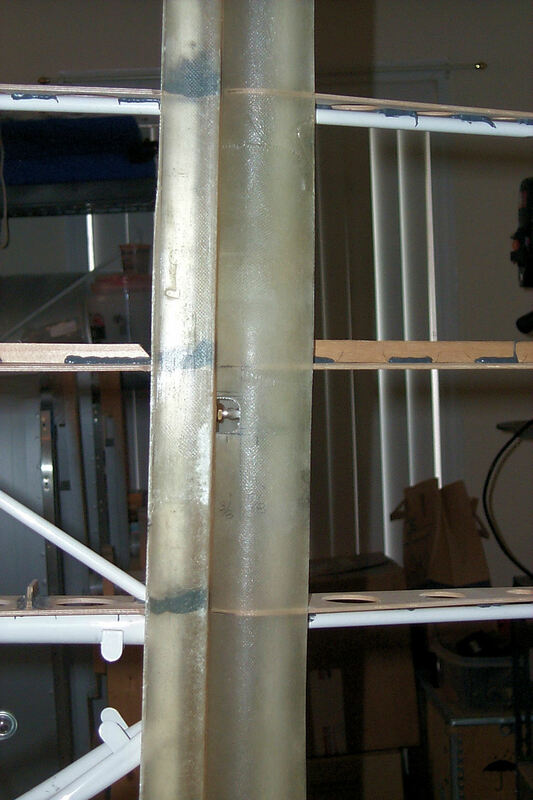 The rudder is temporarily mounted to the vertical stabilizer. 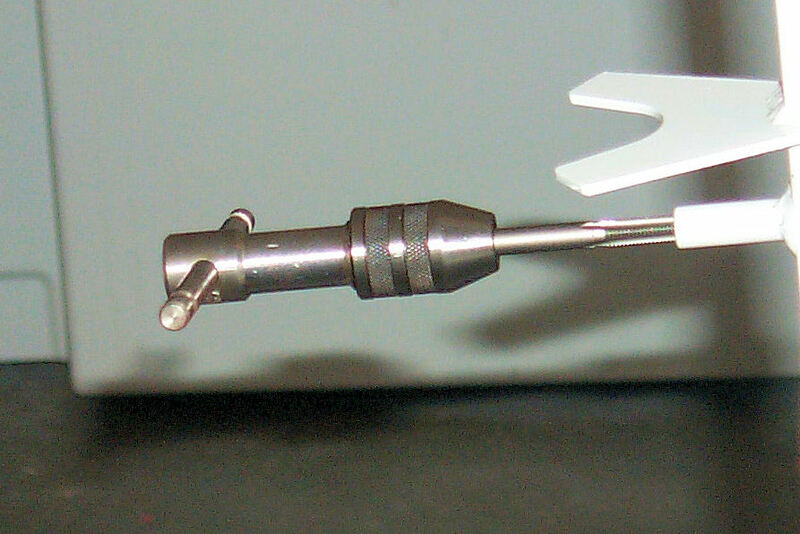 A makeshift angle measurement. 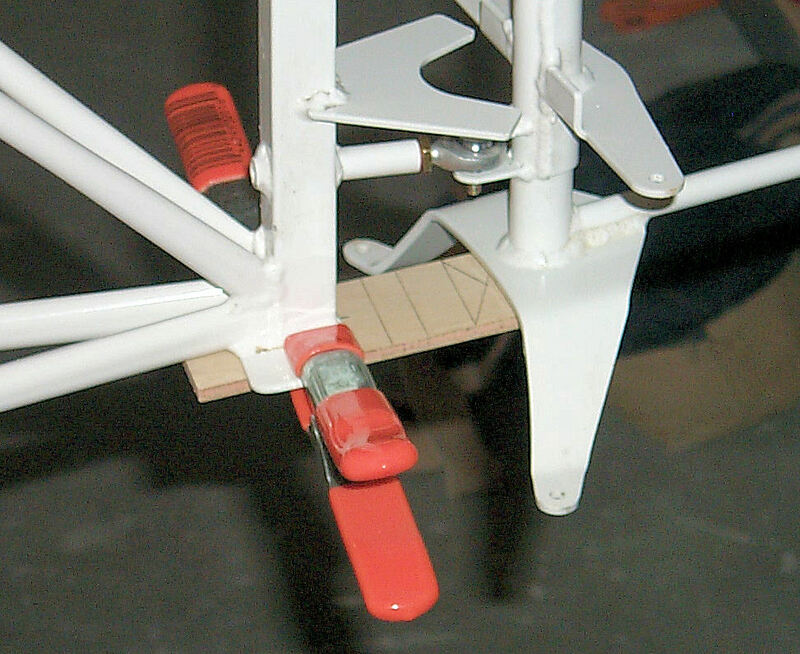 The rudder stop is to limit the rudder travel to 25° each side of the center line. 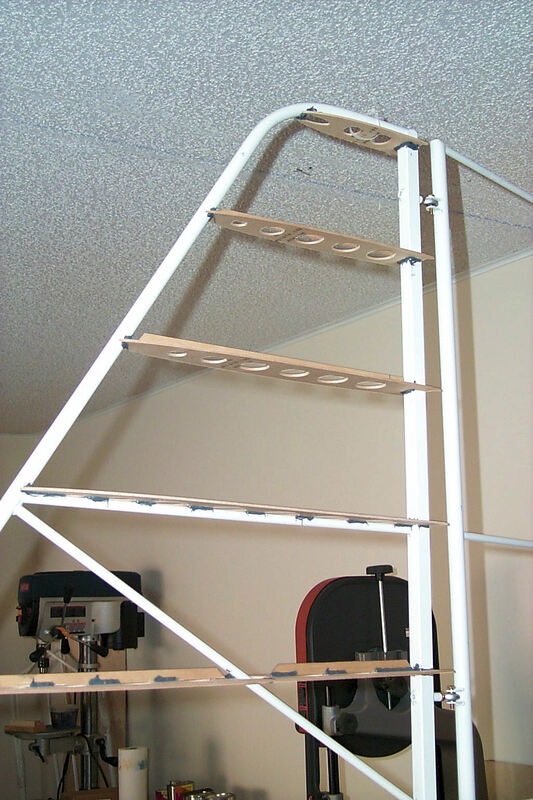 I made a plywood gauge to measure this. As it happened no adjustment was necessary. Tail skid! 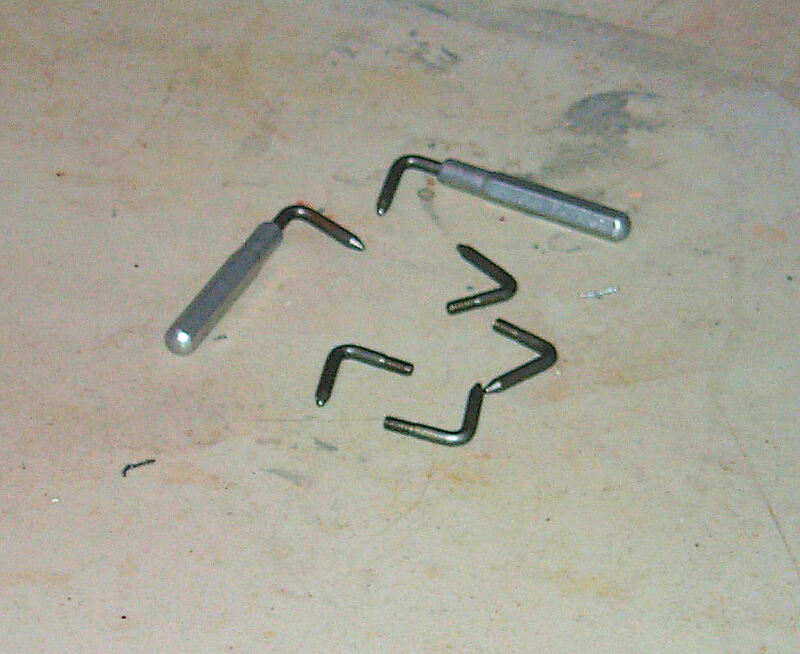 Again I'm using hardware store nuts in order to preserve the AN nuts for the permanent installation. 20 January 2012: The Speedster Tail. 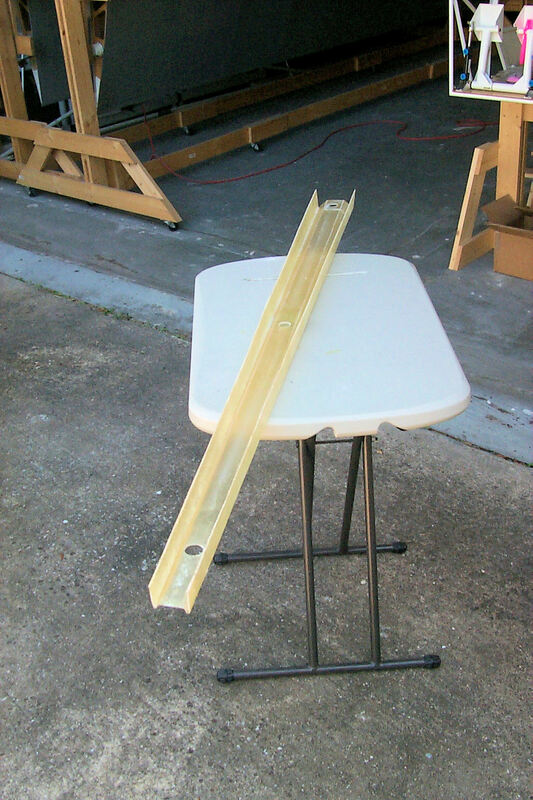 One of the options I purchased is a set of formers to give the vertical tail an airfoil shape. Today I was able to tack in 6 formers and glue them in place with epoxy. 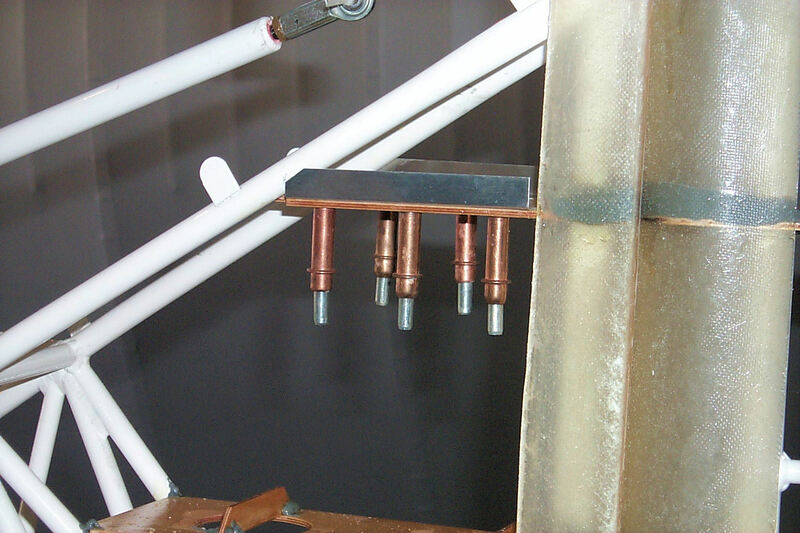 21 January 2012: The remaining formers are glued to the vertical stabilizer. 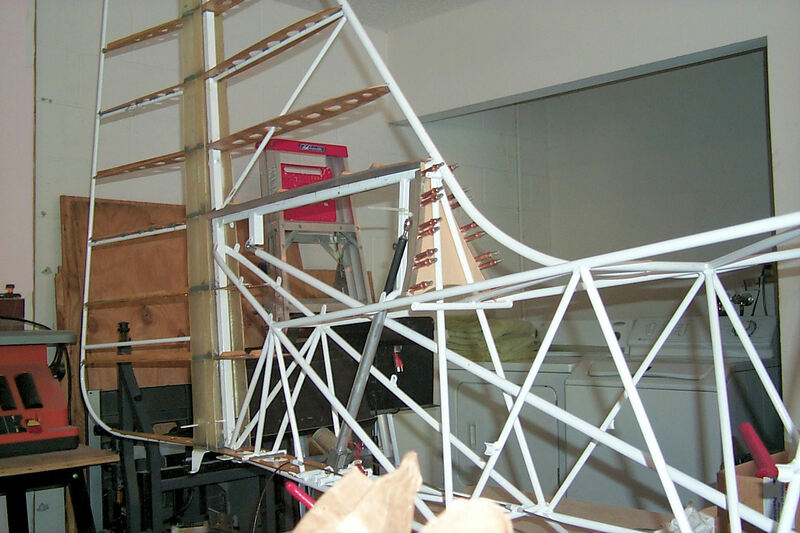 In addition I started on the formers for the rudder. 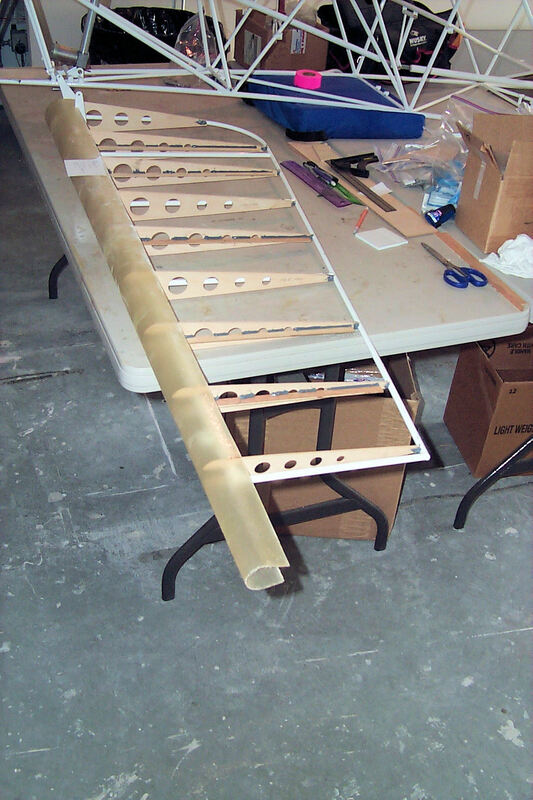 The first step was to glue stiffeners to certain formers. 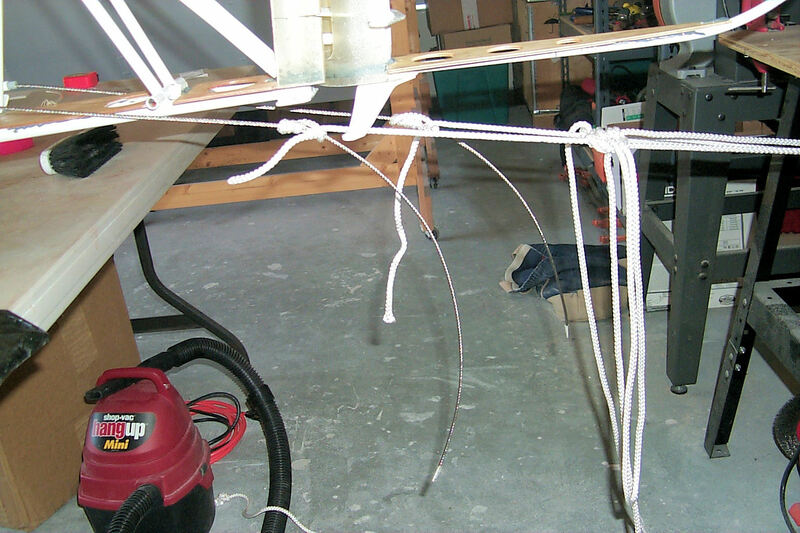 If you look closely you will see "streamers" left from applying the epoxy with a syringe. I learned to not try to clean them before the epoxy is cured. It makes a bigger mess than just leaving it alone. 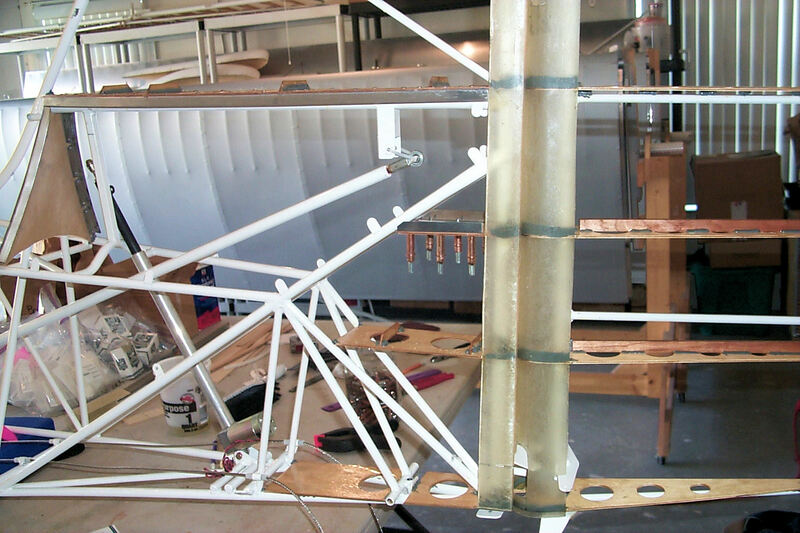 25 January 2012: The rudder formers are installed. The only thing remaining is the tip former. 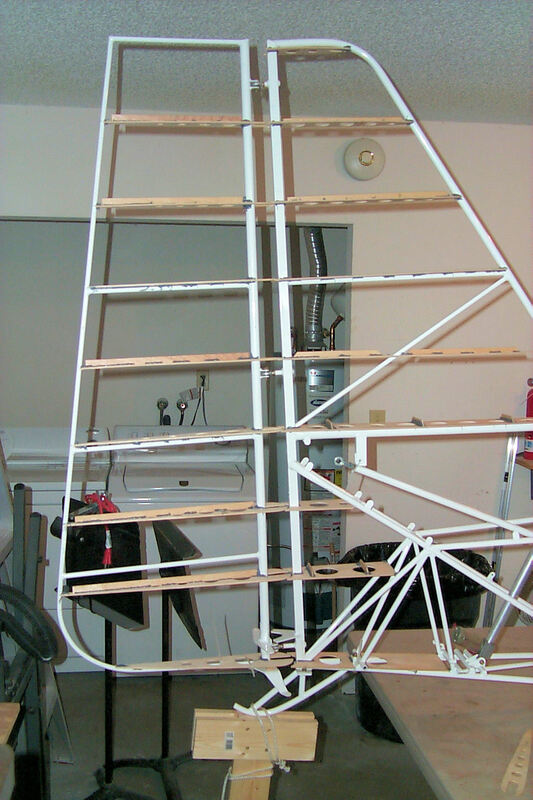 28 January 2012: Fitting the vertical stabilizer trailing edge fairing. 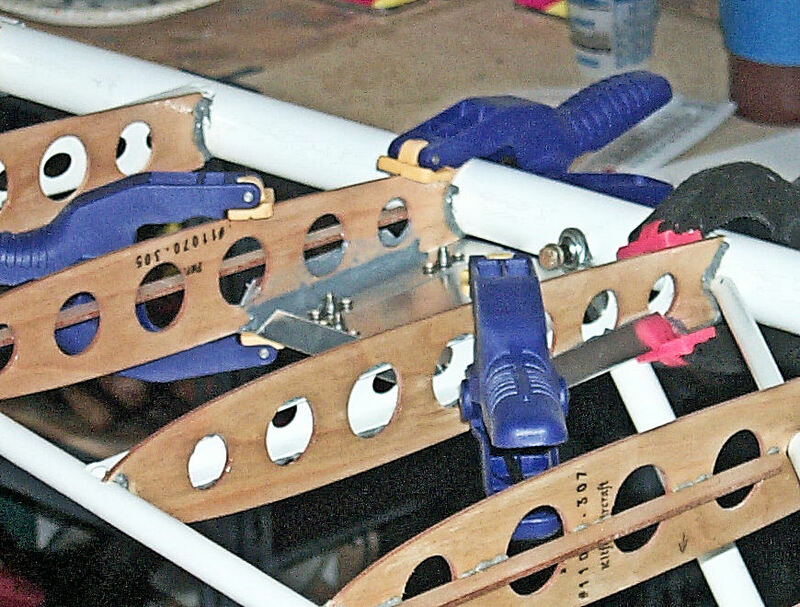 One at a time I made cut-outs for each hinge and the rudder stop. 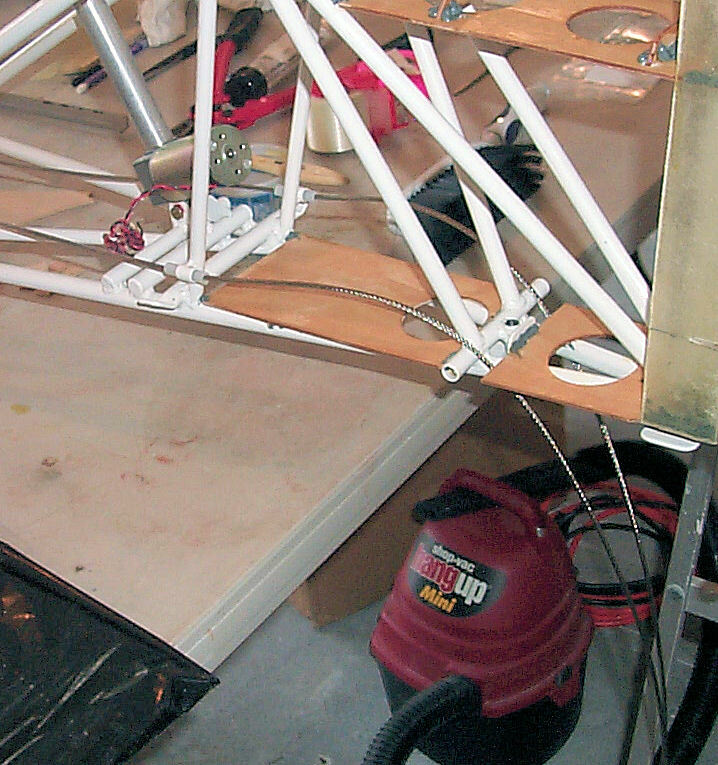 I temporarily re-mounted the rudder to check the clearance. I have a bit more to go before the fitting is correct. 29 January 2012: Done! 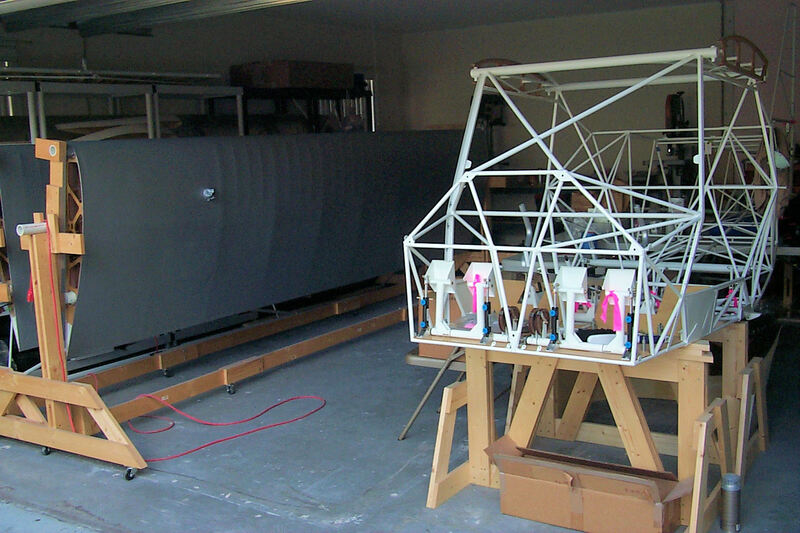 The trailing edge fairing is in place. 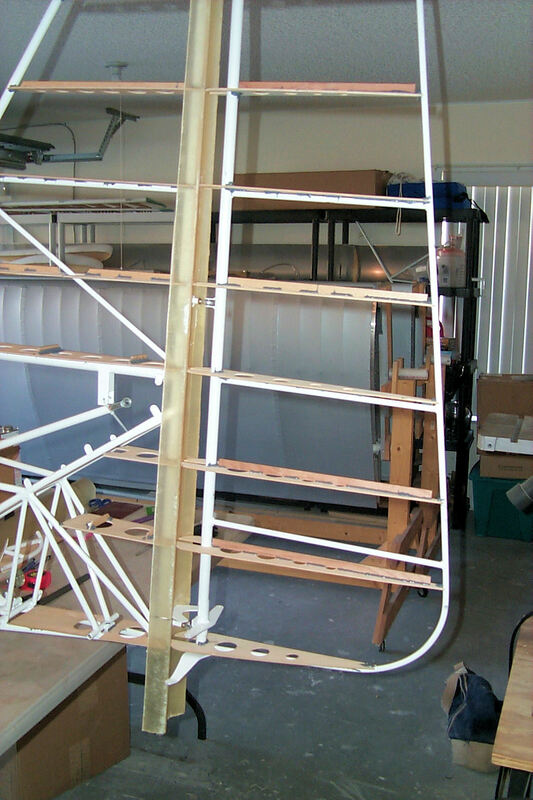 1 February 2012: I started fitting the rudder leading edge fairing. Yes, that is a post-it note telling me what to do next. 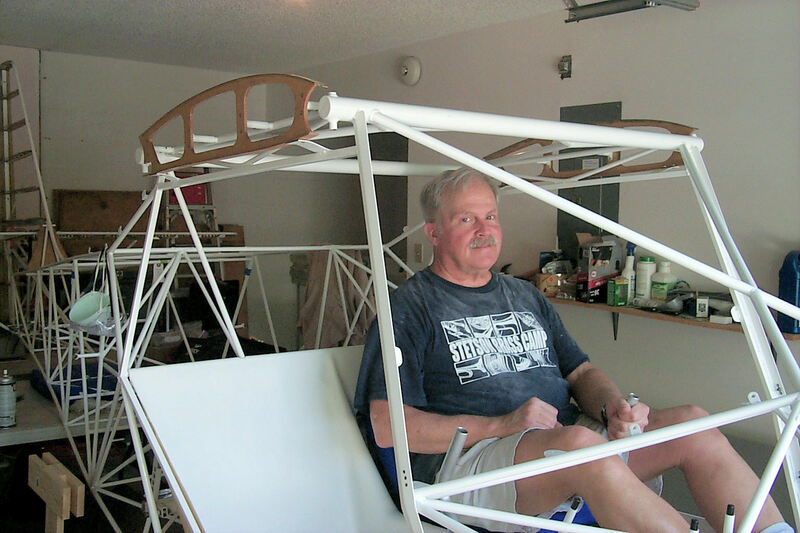 3-4 February 2012: I finish installing the rudder leading edge fairing. 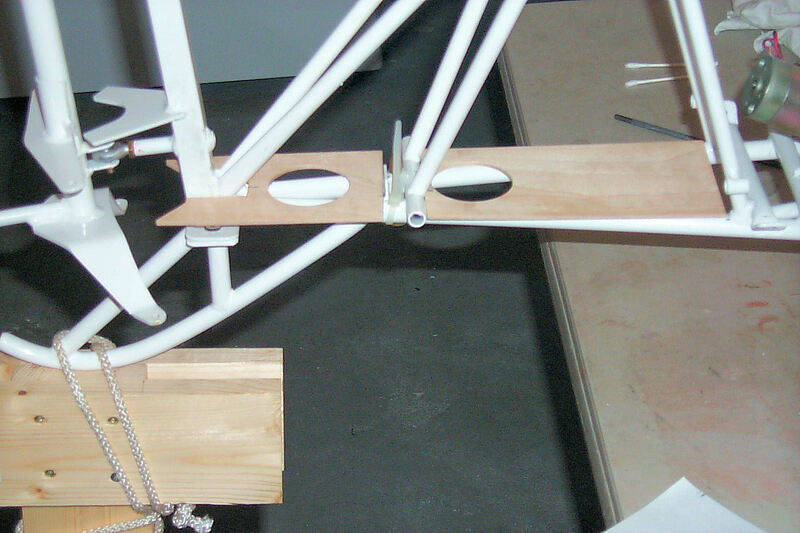 The hinge cutouts include space for me to get my fat fingers in to install the nuts and bolts. You'll notice in the last photo that I've clamped it in place with cable ties. 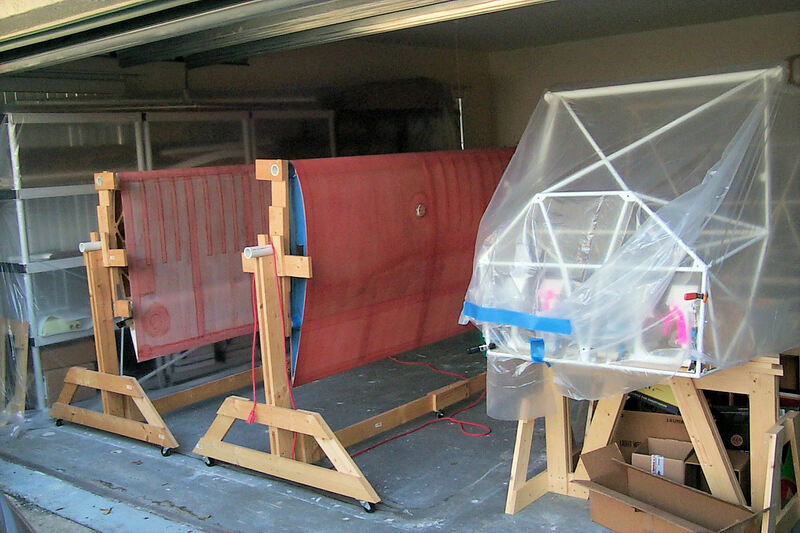 The fact that they fit through the gap between the two fairings without rubbing verifies that there is room for the multiple layers of fabric that will eventually close the gap. 9 February 2012: I know! A bit rough. 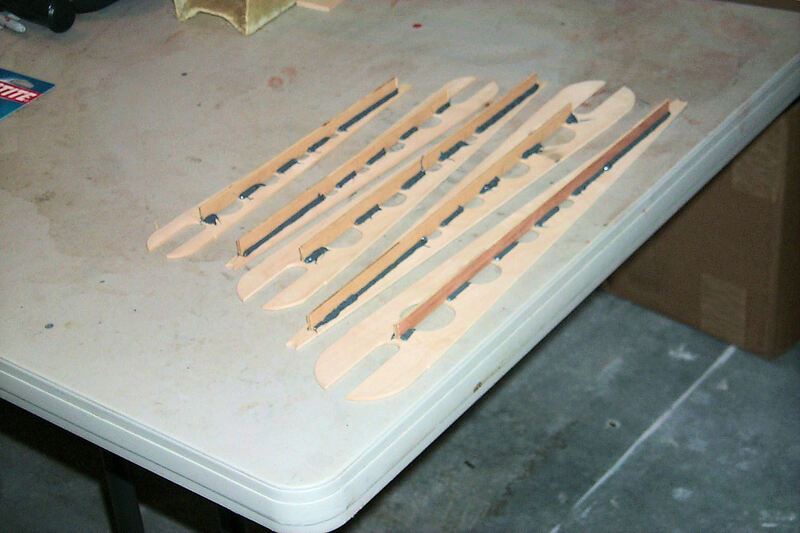 I began shaping the tips of the vertical stabilizer and rudder by rough cutting balsa blocks and gluing them in place. There's a lot of SuperFil and elbow grease before this will look like something I can be proud of. 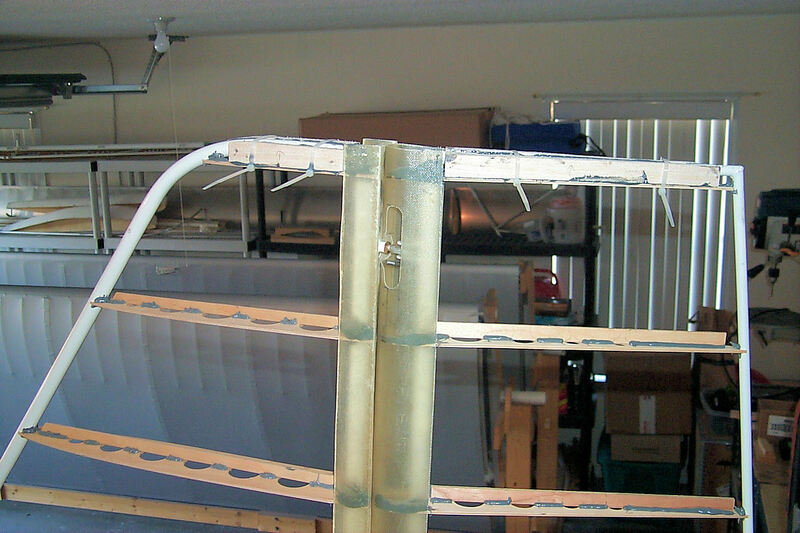 I've learned to prefer balsa over the foam that I used on the horizontal tail feathers. 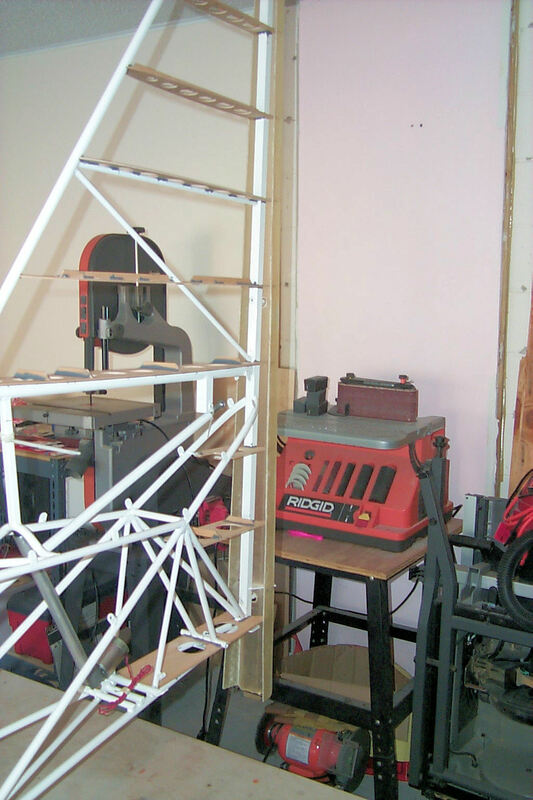 10 February 2012: Squared away! I begin shaping the tips with a sureform plane and a palm sander with 60-grit sandpaper. 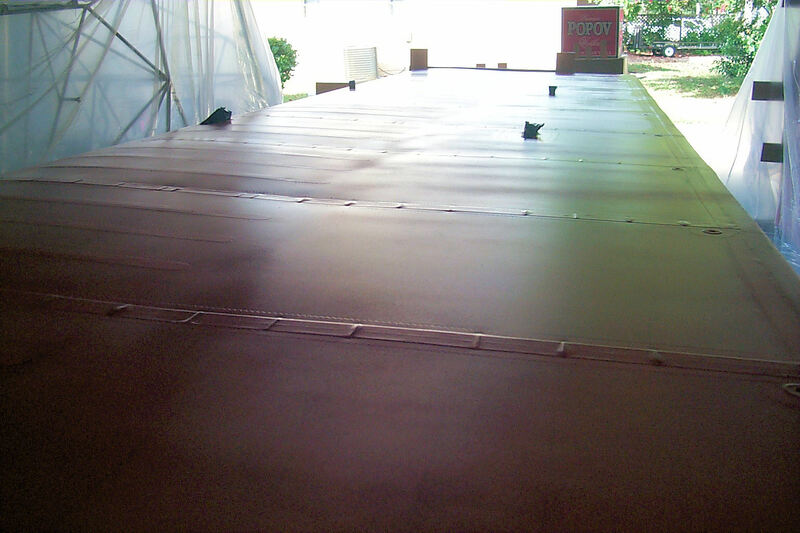 The first step was to give them a rectangular or square sectional shape. 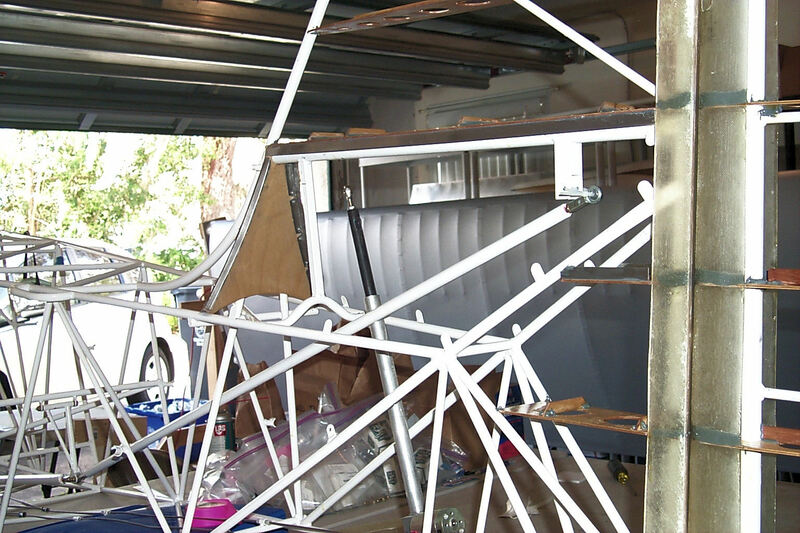 12 February 2012: Best described as "roughed in." I'm very happy with the results of my labors but, more work needs to be done before it's perfectly fair. This will happen before I cover the tail feathers. 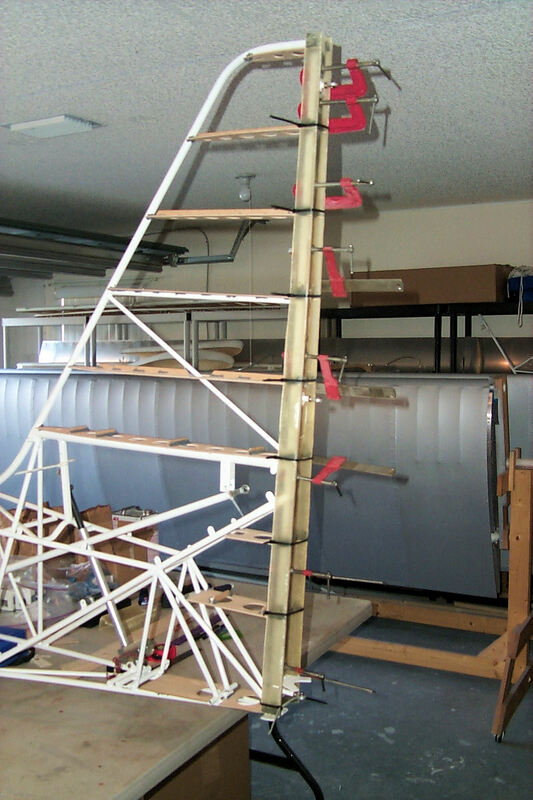 17 February 2012: Applied the first coat of varnish to the wood of the vertical tail. 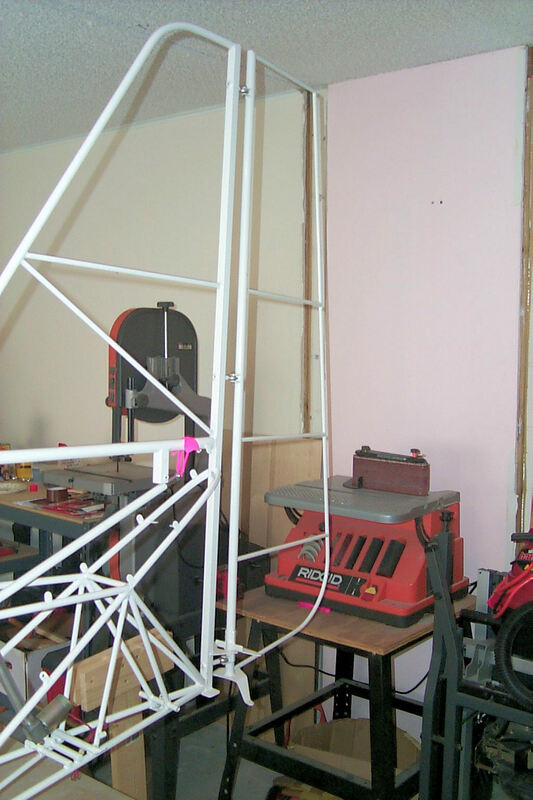 19 February 2012: I started by installing plastic bushings in all the cable fairleads. 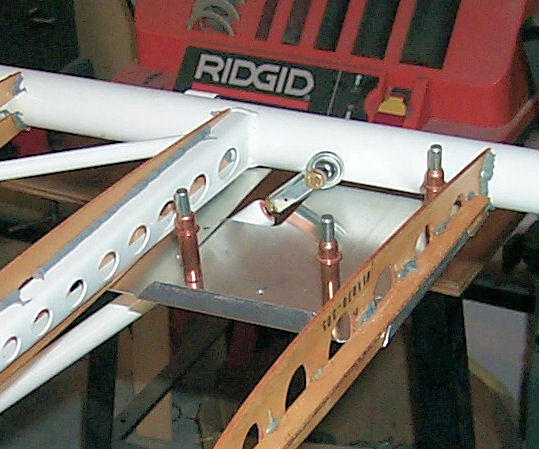 I then threaded the pilot side rudder cables, swaged the cable bushings, and bolted both cables to the pilot side rudder pedal adjust lever. 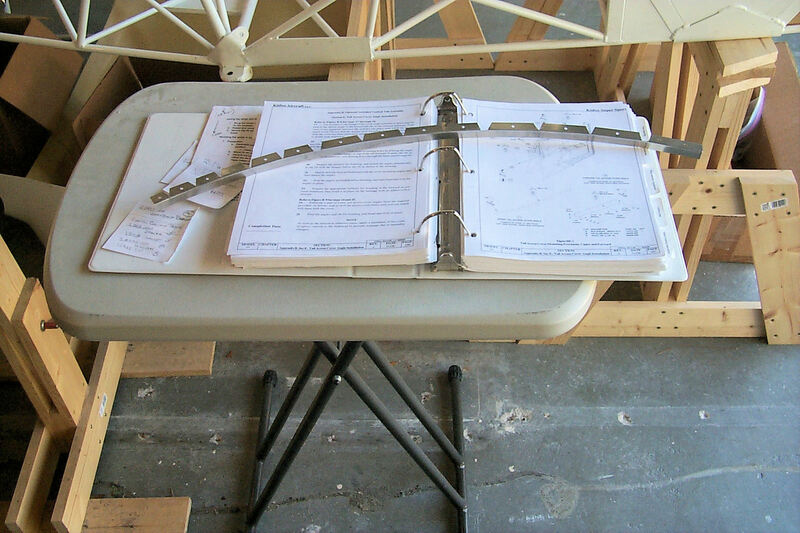 24 February 2012: Special Kitfox rudder pedal alignment tool. And you thought it was a broom. 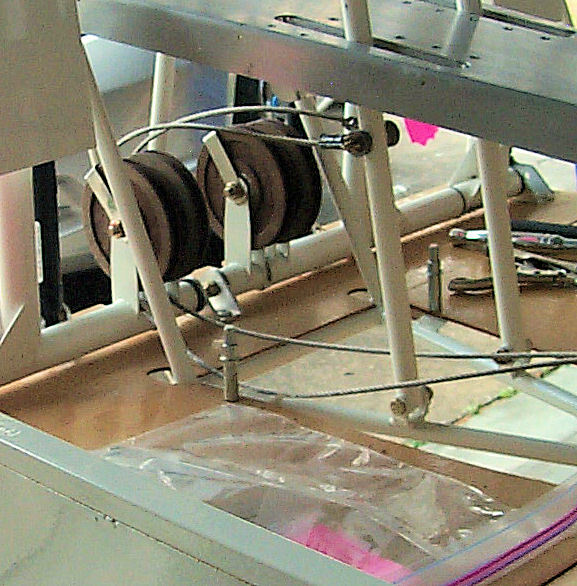 After installing the co-pilot cables it was necessary to secure both the pilot and co-pilot pedals in traverse alignment. My sailing days prove useful. I use a stopper knot to stretch the cables. 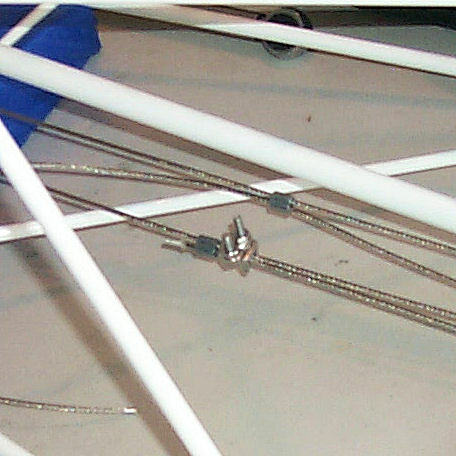 The co-pilot's cables are swaged to the pilot's cables. 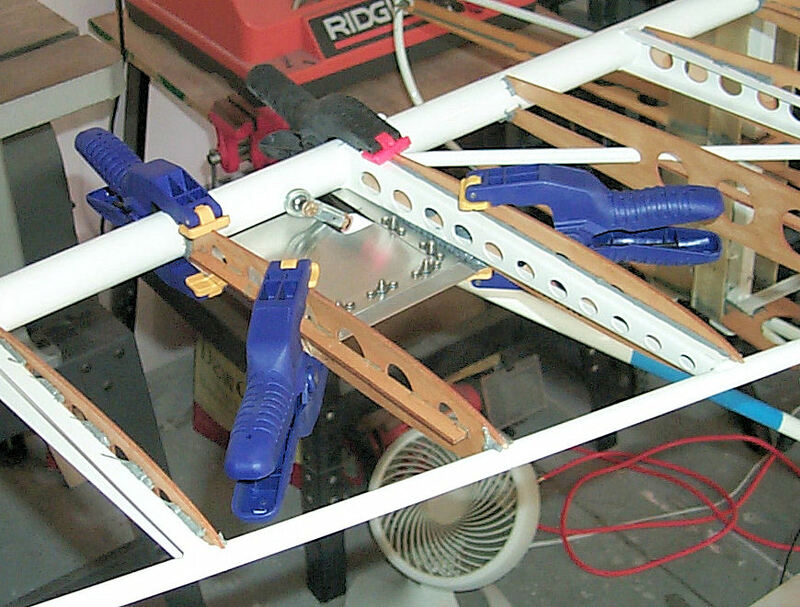 I use a cable clamp to hold the stretched cables in position while I swage the Nicropress sleeve. 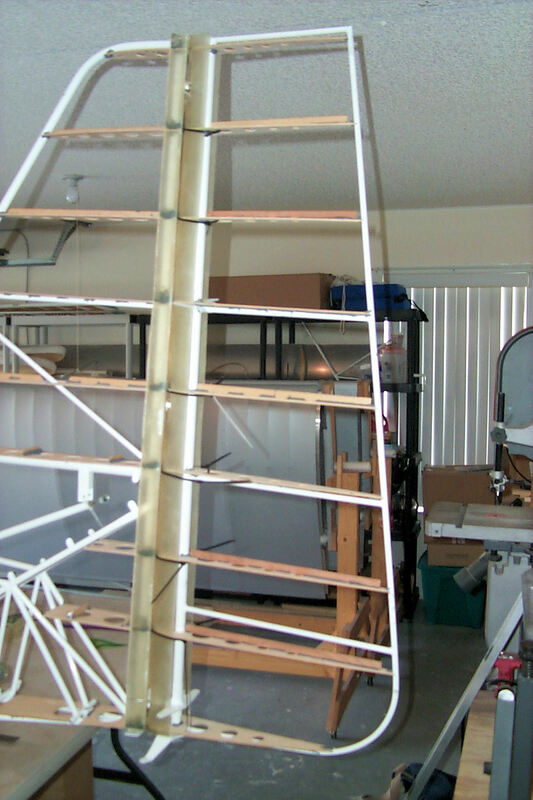 26 February 2012: Applied the second coat of varnish to the wood of the vertical tail. 28 February 2012: Fitting the bulkhead. This had to be trimmed to fit. On the second photo you can see where I marked the edges for trimming. 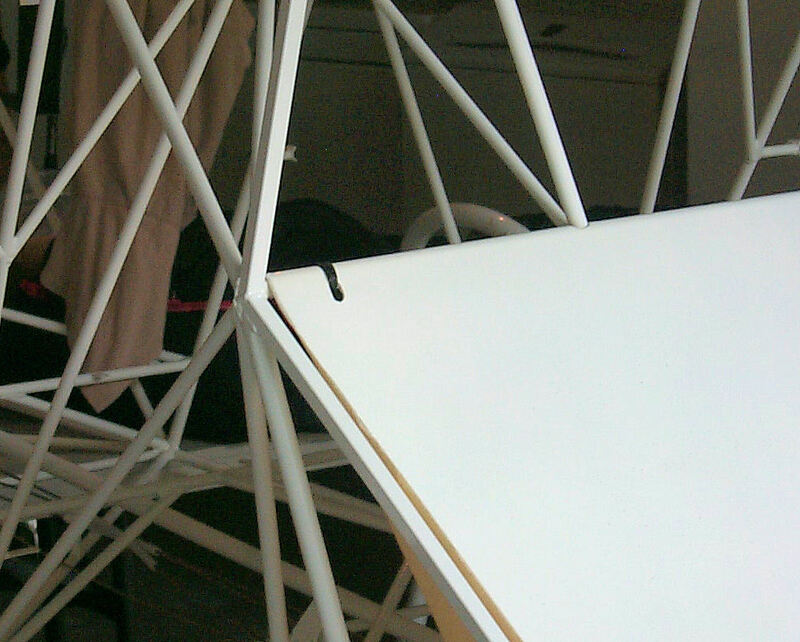 4 March 2012: Fitting the angles. For the purpose of fitting I've placed the angles on the top of the rib. 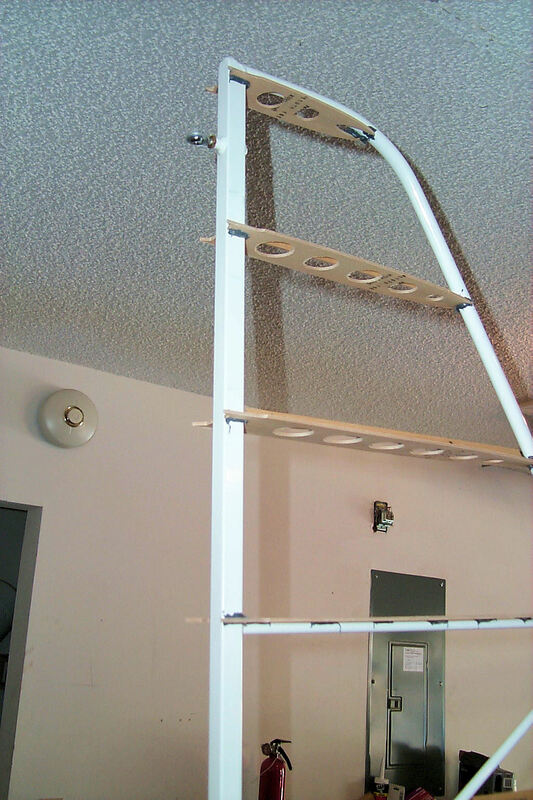 When they are permanently mounted the angles will be on the bottom. 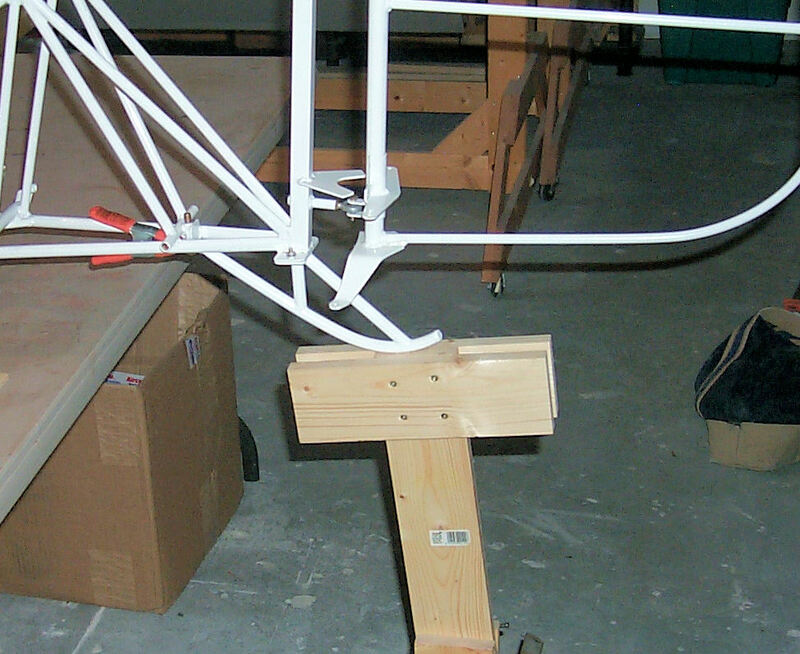 5 March 2012: The angles have been prepped for epoxy. 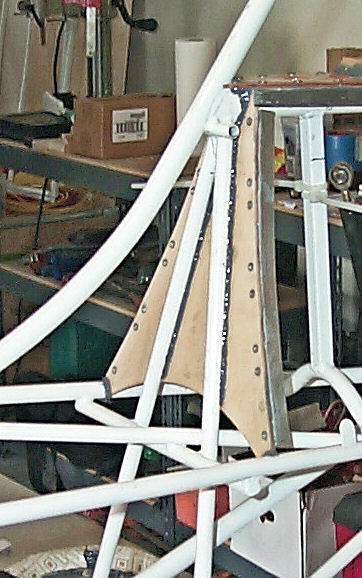 The angles along the top are bonded and riveted to the rib. 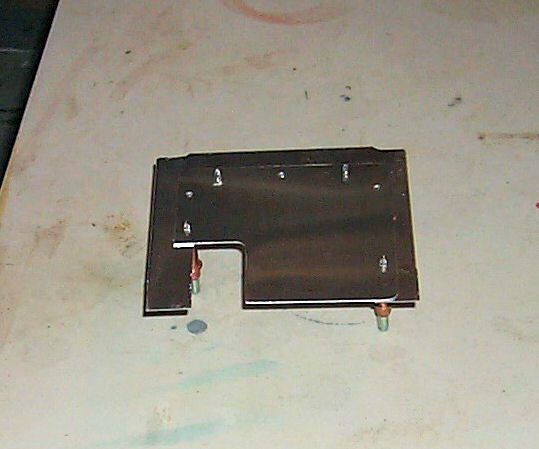 I then fabricated the bulkhead angles and trial fitted them with clecos. The bulkhead is not yet glued in place. 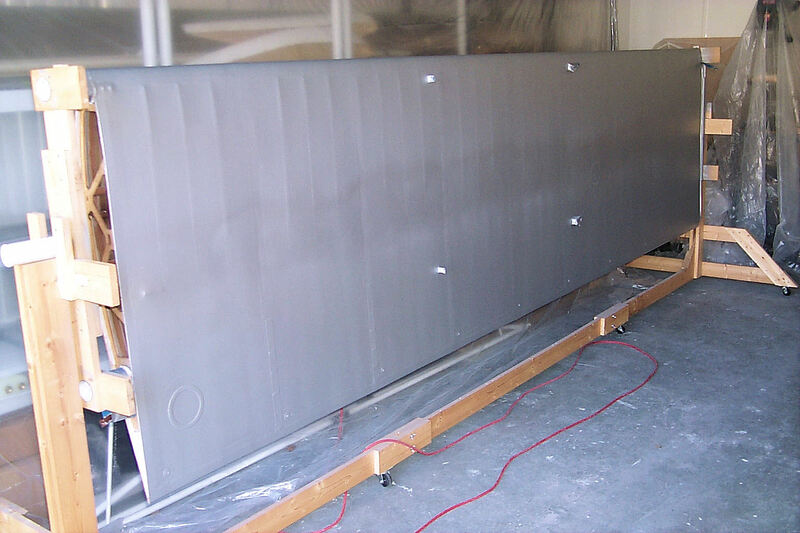 7 March 2012: the bulkhead is bonded in place. 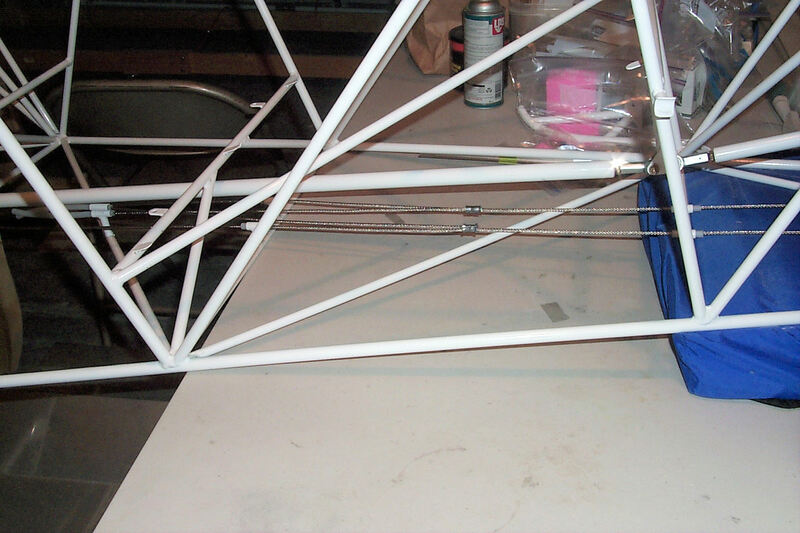 The angles have been bonded and riveted to the bulkhead. 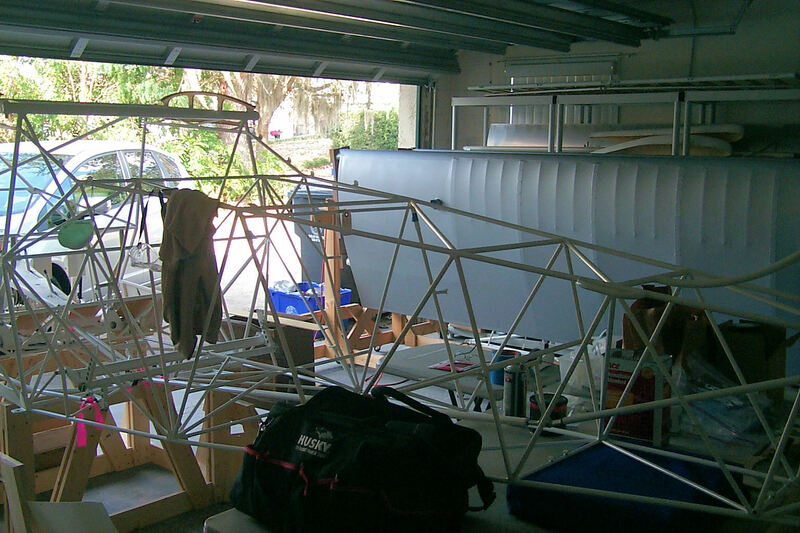 8 March 2012: Fitting the last angles. 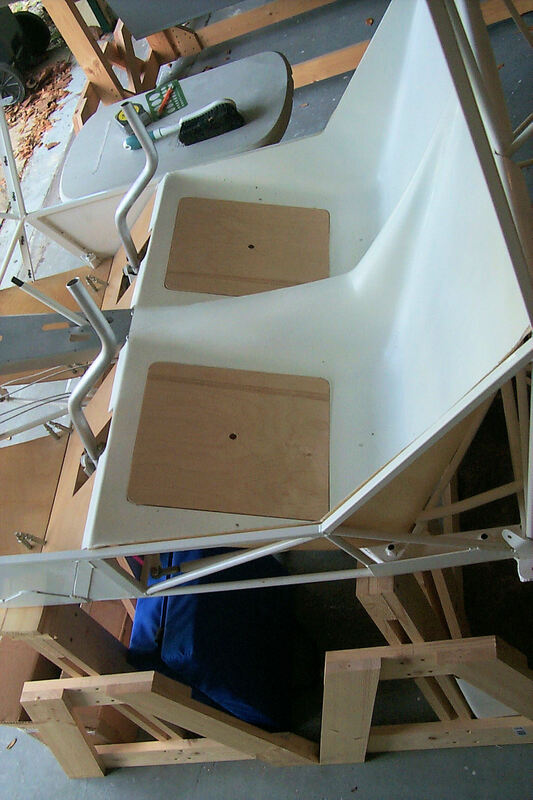 In this photo you can see that all the angles are in place and that I've varnished the bulkhead. 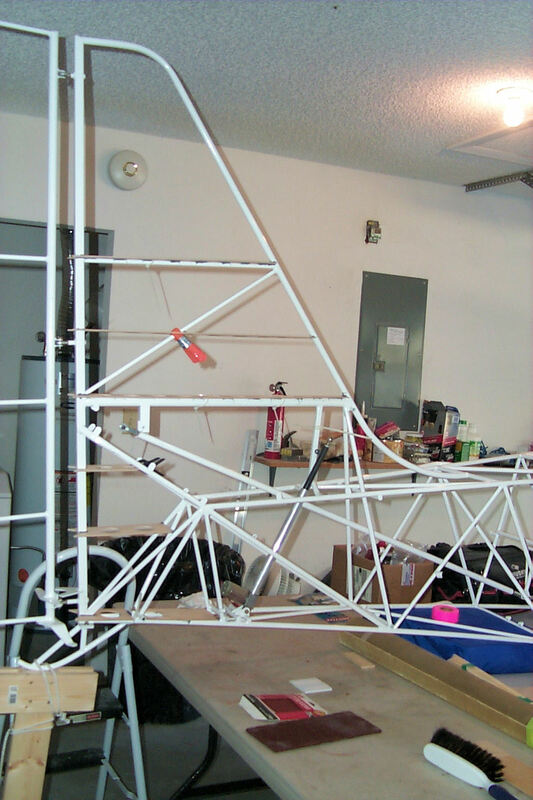 10 March 2012: Horizontal stabilizer lift strut access. 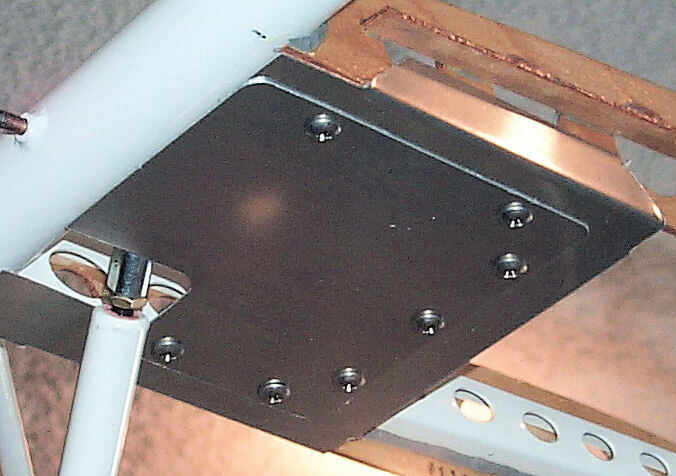 I've decided to frame in mountings for cover plates where the struts attach to the stabilizer. This is a little more elaborate than what the building manual specifies. 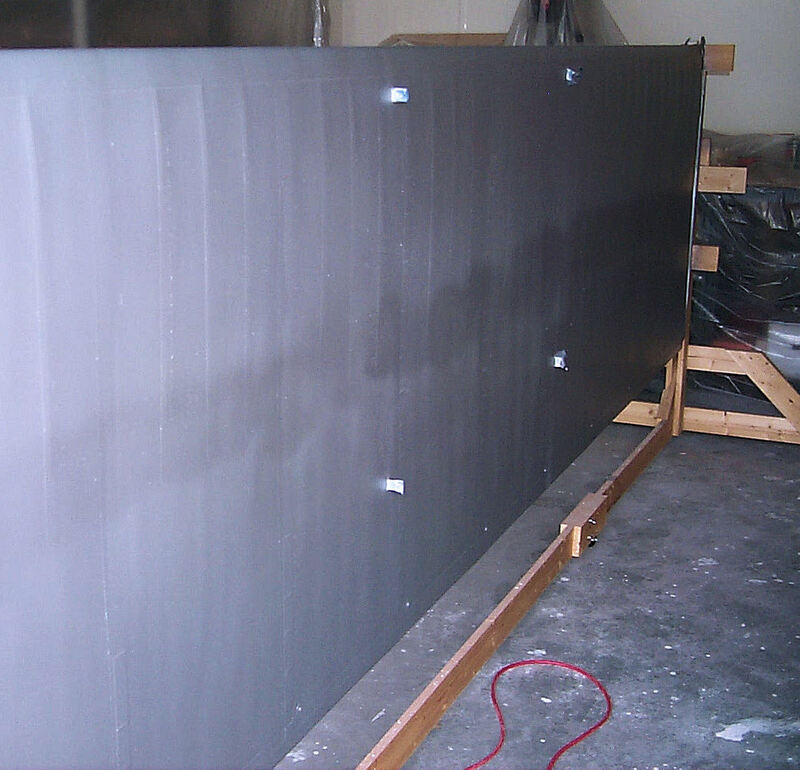 In these photos the frames are pushed into place and will be glued only when everything has been made and proven to work. 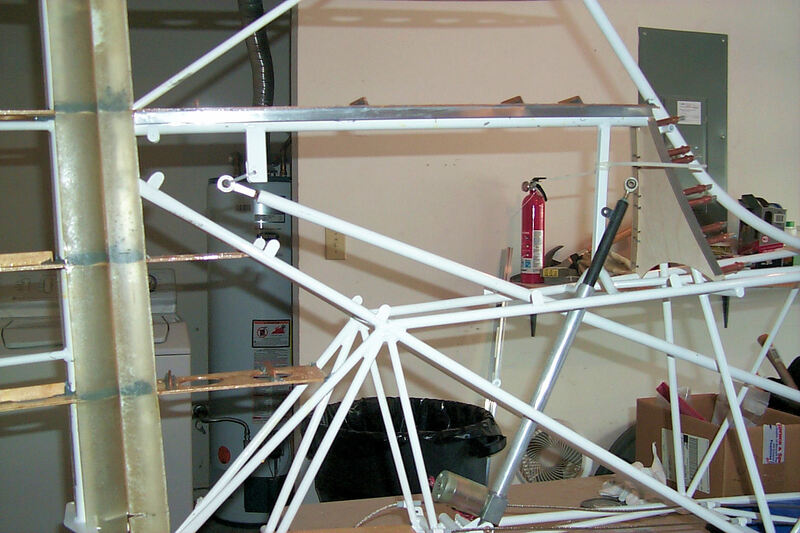 11 March 2012: The frame and plate have been fabricated for the left side. 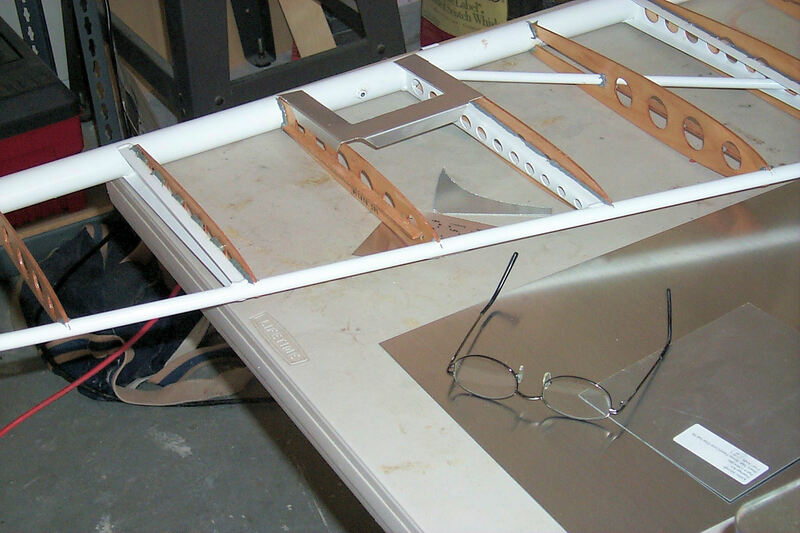 What remains is to rivet the nut plates in place and glue the frame to the horizontal stabilizer. 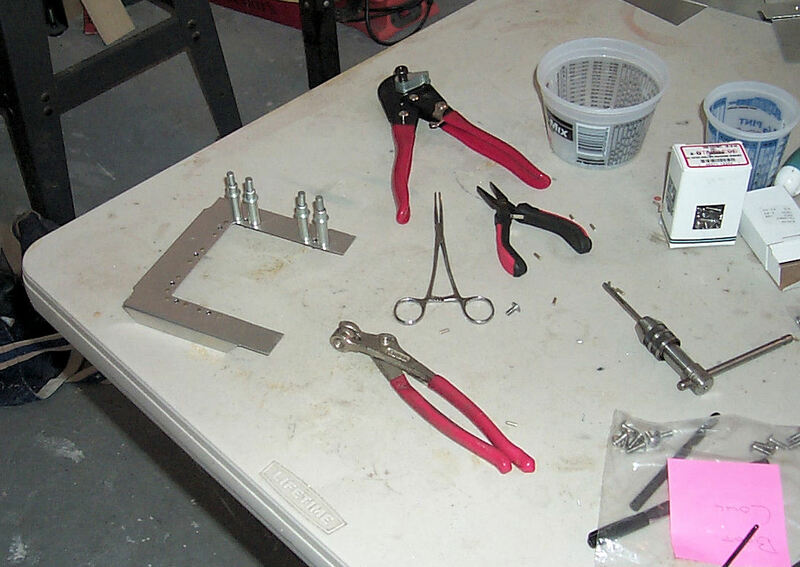 16, 18 March 2012: I begin to rivet the nut plates. 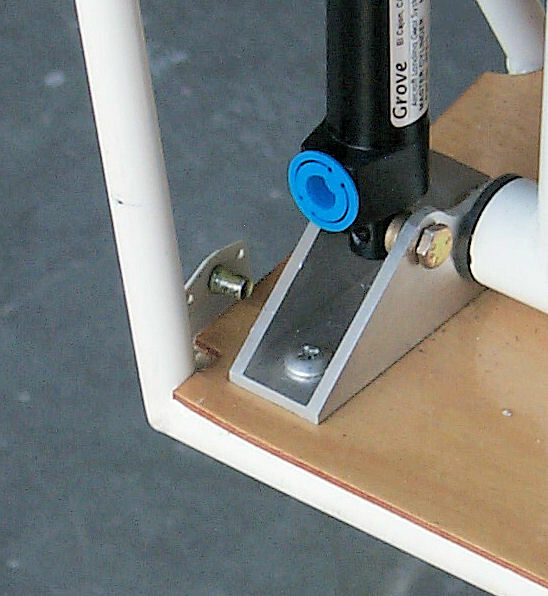 I use the tap to carefully relieve the amount of force necessary to drive the screw. I want enough resistance to keep the screw in place but not enough to require excessive force with the screwdriver. Not a good thing on a fabric covered structure. After a trial fit I glue everything in place. 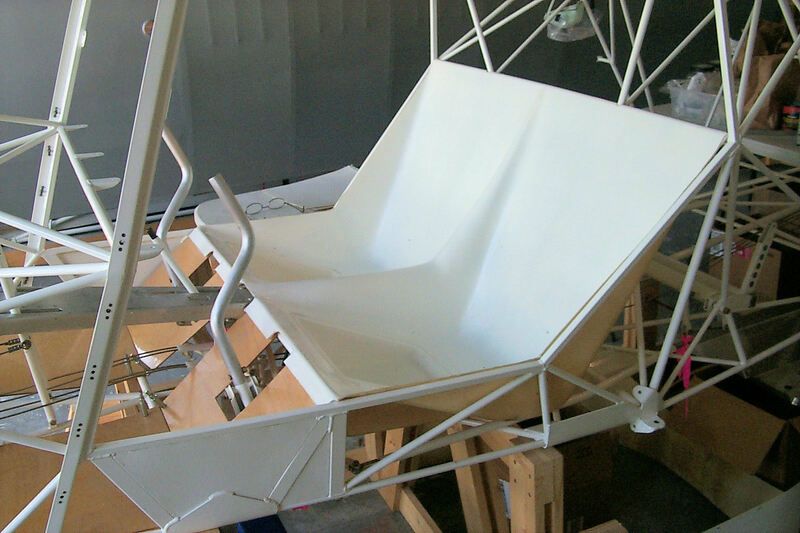 Fitting the Seat: I'm not finished with the tail feathers but I wanted to work on something different. 21 March 2012: Finally!! I can make airplane noises. Yes, I'm covered with dust from grinding fiberglass. There's more grinding to do. 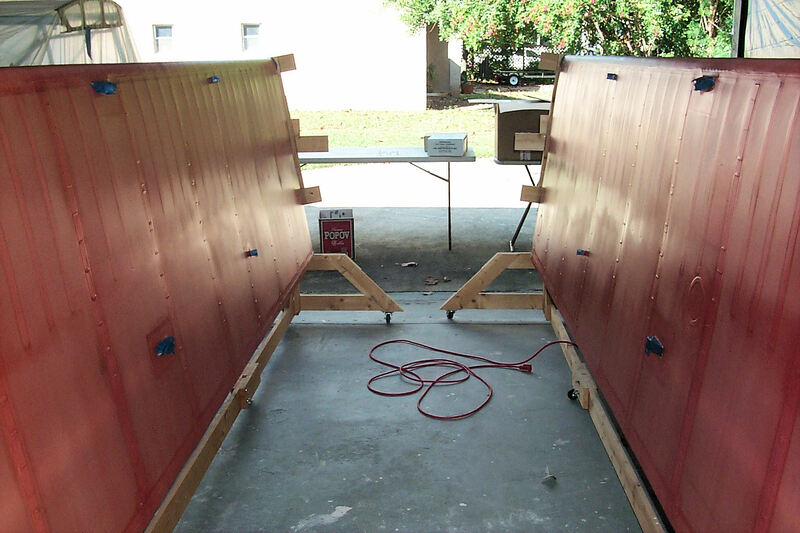 23 March 2012: Storage Bins: The kit provided fiberglass panels but I decided to use some birch plywood that was laying around the shop. I'll coat these with West System epoxy. 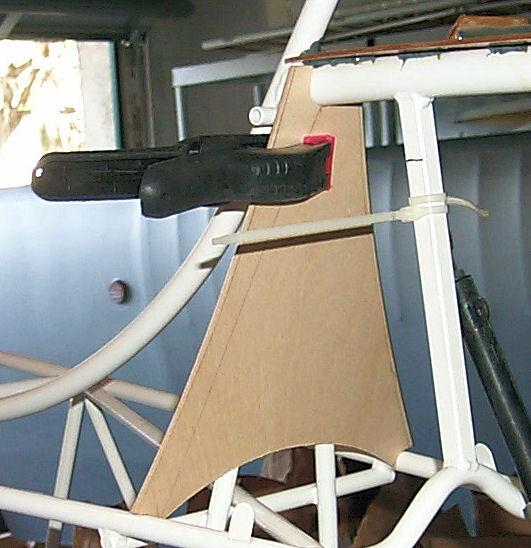 The plywood is roughly the same weight as the fiberglass, so, no penalty. 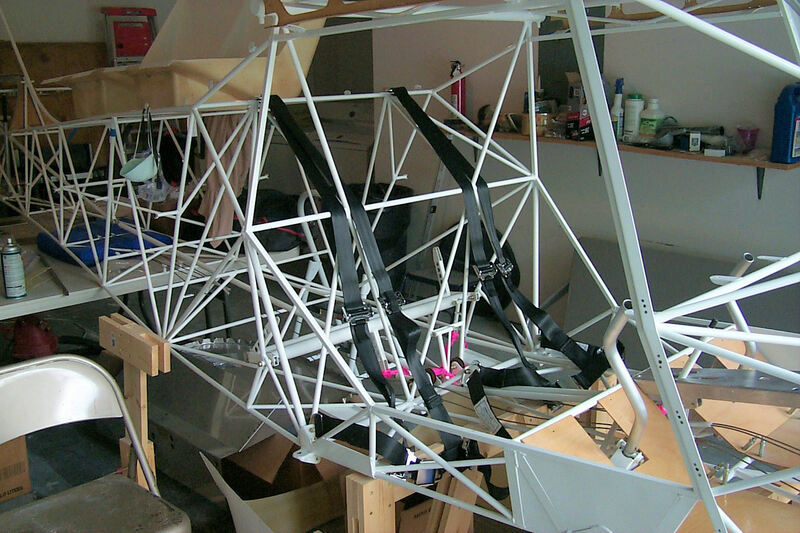 24 March 2012: Trial fitting of the seat belts and shoulder harnesses. I'll wait until I have the seat cushions before I spot the locations of the slots through the seat. After assured of their fit I immediately removed the beats and safely put them away.